Lockcid is the most appropriate product to make dry systems installations with possibilities of replacement by using an auto-adhesive mushroom-shaped lock that clips together by pressing among themselves. These adhesive bands are glued on the ceramic back and also on the wall support to their placement. LockCid can be used in many surfaces as: ceramics, wood, melamine, steel, polystyrene, Wedi, PVC, aluminum, plasterboard, etc. LockCid is not recommended for wall support such concrete or mortar. Self-installations of porcelain tiles through bonding dry system. Replaceable. Appropriate to places with continuous renewals. 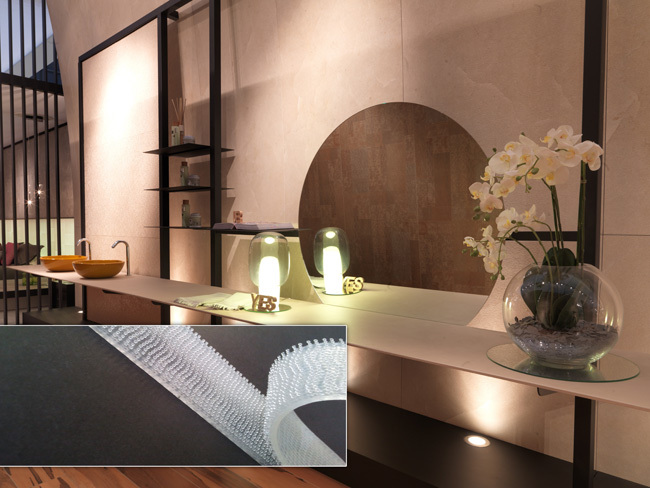 Suitable to be installed on plasterboard, PVC, showroom exhibitors, Wedi panels, ceramic tiles, metals, wood and marble. Necessary applying Lockcid primmer on the ceramic backside as well as on the wall support. Do not apply directly on porosity or absorbents supports such as mortar, concrete or rustic wood. In these cases, we recommend the previous installation of plasterboard or Wedi panels. All supports must be resistant, stables and completely regulars, dried and without dust or any other element that decrease adherence.